At CDC Victoria, we are continuously innovating to improve customer service and enhance safety. We launched the Passenger voice announcement (PVA) systems on all CDC Victoria route buses in 2017/2018. The PVA system is part of our plans to invest in innovation, improve customer service, lower fare evasion levels and enhance overall safety on board. The system provides a welcome message when doors are opened and also includes a friendly reminder for customers to ‘touch on’ with their myki cards. 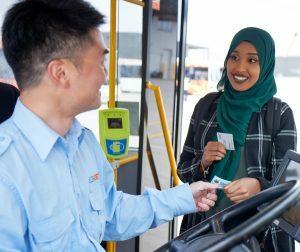 The idea is to allow our drivers to focus on providing personalised customer service, while the friendly reminder for customers to “touch on” using their myki card aims to diminish fare evasion levels. 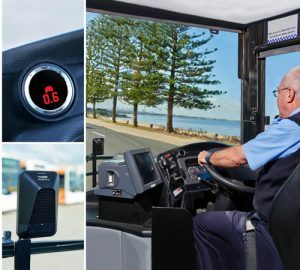 We are proud to be the largest bus company in Australia to adopt Mobileye’s aftermarket solution. The vision-based collision avoidance system helps drivers to keep an “extra eye” on the road by alerting them to potential accidents and cutting reaction times. Mobileye consists of a compact monocular high definition camera mounted on the windshield, which constantly monitors the road in front of the vehicle. This information is then displayed on a small dashboard device. In addition to visual alerts, the unit sounds an audio warning to assist the driver in preventing or mitigating a collision. The alerts monitor four main areas: safe following distance; forward collision alert; lane departure without signalling; and pedestrian and cyclist collision warning. Mobileye technology helps drivers improve their driving habits and maximise concentration. Alerting them to various hazards before they occur encourages better driving habits, and with ongoing use, changes behaviour to produce a safer, lower-risk driving environment. Safer driving and a greater safety awareness help to protect the lives and safety of drivers and passengers as well as other road users, including pedestrian and cyclists. The implementation of Mobileye technology took place simultaneously in Victoria and NSW.